Last week, in part one of this post, I covered just a few of the wonderful specialty and boutique shops that have recently opened in the Old Town area that have transformed our quaint town into something akin to California's wine country. While places like Sonoma, Napa, and the Napa Valley cities of St. Helena, Calistoga, and Yountville are known for their specialty shops and of course wine, they are far more renowned for their simply amazing dining options. Alex and I have been repeat visitors to Napa Valley for the last several years, and we always find ourselves floored by the unbelievable food. Bottega, Brix, Mustards, Tra Vigne (Pizzeria or Restaurant), Greystone, Ubuntu, El Dorado Kitchen, Go Fish, and Taylor's Roadside Refresher (Gott's Roadside) are all amazing places, and I'm talking "dream about your meal" amazing. (I'm still thinking about Chef Michael Chiarello's burrata and english peas from Bottega I inhaled savored in April. But I digress.) And these are just a few great places we've been. The list goes on and on. Note: I do have to admit, the best part of one trip to Napa was when Chef Michael Chiarello asked me if I had enjoyed my meal... LOVE HIM! The biggest problem with visiting Napa Valley is the gastronomical overload that you can often experience. When you're there for three or more days, eating rich food for breakfast, lunch, and dinner, combined with frequent wine tastings, you can easily end up in food OD! I often dream about living there, and dining at one of these amazing establishments just once per week to really appreciate our meal, rather than cramming too much into a short visit. 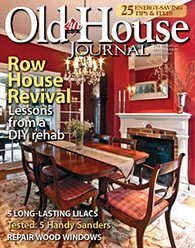 But as I alluded in the title and in last week's post, over the last couple of years we've been presented with a true treat right at home in Old Town. The dining scene has simply taken off in the last five or six years. Old Town, once known for mediocre seafood and stuffy/touristy restaurant atmospheres, has been the site of a food movement. And, as luck would have it, we happen to live in the center of it. The D.C. metro area is a highly populated and culturally rich area that seems to be packed with a population that has a very discerning palette. 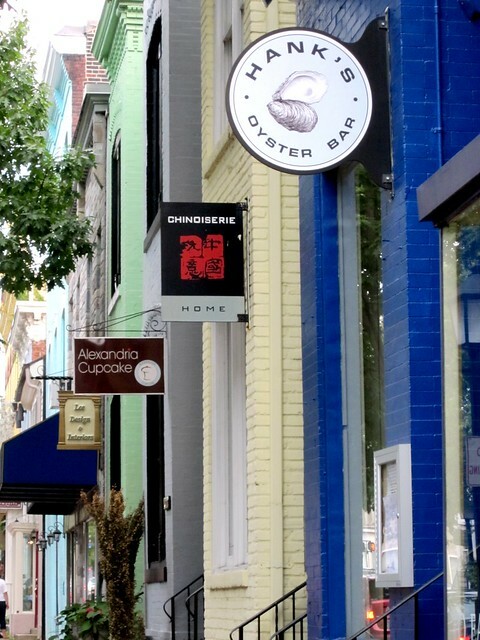 As a result, the Old Town area has recently taken to the foodie scene with new offerings from casual to elegant, but all quite delectable and inspired. 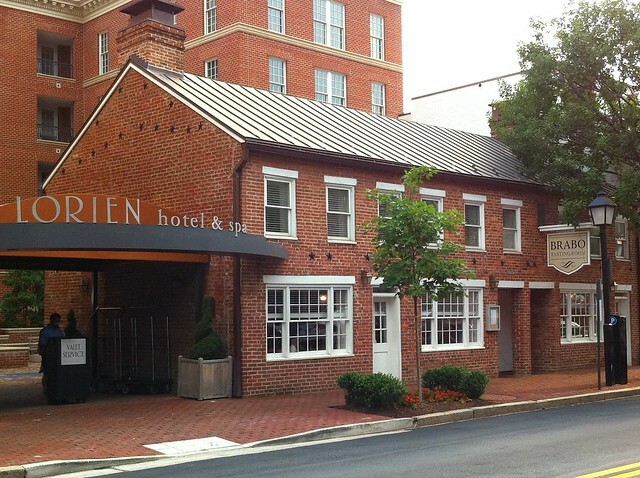 Adjacent to The Butcher's Block in the 1600 block of King Street, and also part of the Hotel Lorien Kimpton property, you'll find Robert Wiedmaier's Brabo Tasting Room. Quite possibly my new favorite restaurant in Old Town, it strives for and attains that Napa Valley feel. Be it the delicious cheese plates, the wood fired tarts (think little scrumptious pizzas), the fine wine selection that includes several of our favorites from Napa Valley (a glass of Sequoia Grove Chardonnay anyone? ), or their signature unbelievable mussels. (If anyone from the Tasting Room is reading this, pleeaaaassseee bring back the Indian curry mussels!). A fine but casual experience, I think I could go there almost every night of the week. 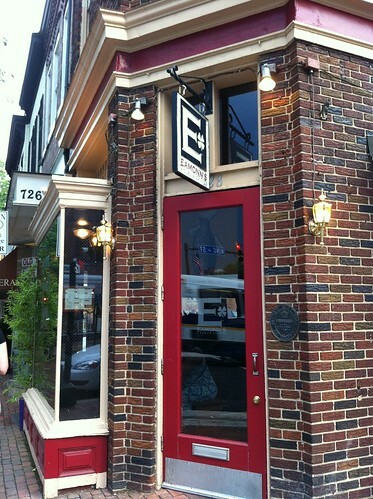 If you're looking for an upscale but very casual and laid back dining experience, head on over. It's a small place, and you may need to wait a bit for a table since no reservations are accepted, but it is so very worth the wait. Trust me. Brabo Tasting Room, 1600 King St.
A slightly less casual, but no less delicious restaurant is Vermilion, and it sits just a few blocks towards the water in the 1100 block of King Street. Vermilion opened its doors several years ago, but has been getting a lot of attention from the foodie scene after several write ups in local and national publications. Yep, even the New York Times. Their menu presents as "modern American" cooking, with locally sourced and farm raised ingredients whenever possible. For us, every time we've gone we've thoroughly enjoyed our meal. Plus, if you're looking for a vibrant bar scene, this is a good place to go, though it can get somewhat loud and crowded on a Friday night. Vermilion Restaurant, 1120 King St. 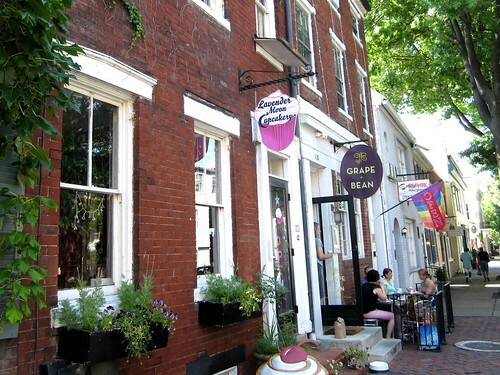 Continuing back towards the water, you will run into a quaint row of colorful buildings that house a few local favorites for good food and some sweets to follow. 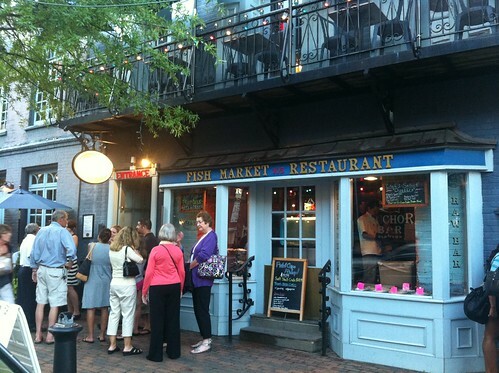 The first is Hank's Oyster Bar, with great coastal fare perfect for sharing or eating all by yourself. The name says less than half of their offering, but It is a great place for a casual shellfish dinner. Take just a quick two door stumble from your meal at Hank's and you can make a quick stop at Alexandria Cupcake to satisfy your sweet tooth. One of several cupcake stores in Old Town, their Peanut Butter and Jelly cupcake (not always offered) is one of Alex's favorites. He's what I like to call a cookie peanut butter monster. Hank's Oyster Bar, 1026 King St. & Alexandria Cupcake, 1022 King St. The Majestic, 909 King St.
Quite literally across the street from The Majestic sits one of Alexandria's many options for brick oven wood fired pizzas. Red Rocks opened just last year and has quickly become our favorite pizza restaurant. The pizzas are creative, made with fresh ingredients, and remind us of the pizzas we've come to love at our Napa favorite, Tra Vigne. Unlike some of the wood fired pizza places, the crust at Red Rocks is not overdone and burned, which makes it a winner in our book. Red Rocks, 904 King St.
Less then two blocks from The Majestic and Red Rocks, and located in an historic building on the corner of King & Columbus, is another casual but excellent dining experience at chef Cathal Armstong's Eamonn's a Dublin Chipper. If you're looking for the best fish & chips this side of the Atlantic, look no further. Eamonn's has been featured in countless publications and television shows, including Anthony Bourdain's "No Reservations." The batter is golden and delicious and the chips are perfect, and it is the only place I know of in the area that serves my favorite cider, Strongbow (I love London too, you know). If you're not totally stuffed after you finish up your fish & chips, order up a fried Milky-Way bar. Yep, you heard me. Deep fried then rolled around in cinnamon sugar. It's...AMAZING. Eamonn's a Dublin Chipper, 728 King St. 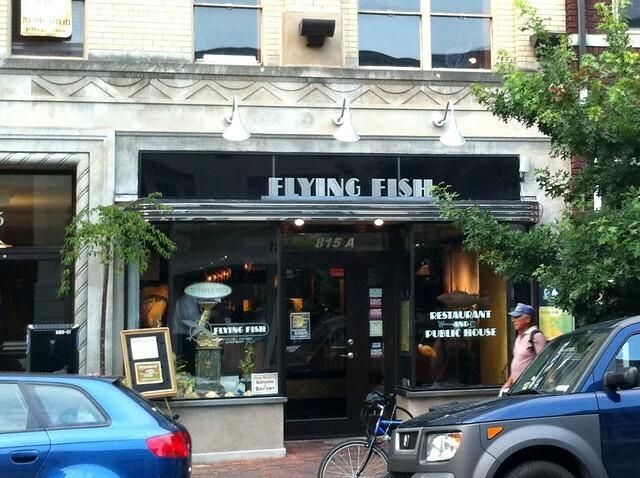 If you'd rather your fish raw, just glance across the street from Eamonn's and you'll find Flying Fish. Whether you are looking for classic sushi or something more modern and creative, Flying Fish can fill your sushi desires. If you're not into sushi, have no fear, the menu has a great non-raw selection, including one of my favorite sides, the Bleu Potato Dumplings (think little fried balls of blue cheese and mashed potatos). They also have a good $1 sushi happy hour menu each evening. Flying Fish, 815 King St. If it's a quick and casual burger you're in the mood for, Old Town has just what you're looking for. 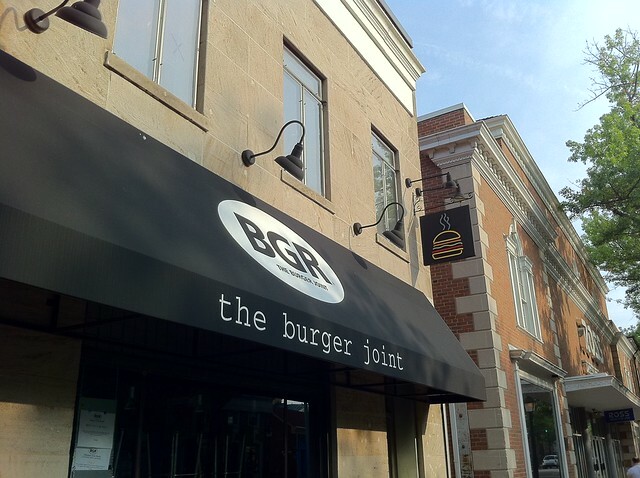 The Burger Joint, or BGR, opened just off of King Street in the 100 block of North Washington Street just two years ago, but had a loyal following from day one. BGR has other locations around D.C. (and many more have opened up around the country), but all have one thing in common, great burgers and fries made to order. The Old Town restaurant is kitschy and cool with a 1980s rock and roll music theme, which gives you something to enjoy while waiting for your juicy burger. Alex doesn't eat meat (we call him vegetarian, but he does eat fish, so....), and he swears by their veggie burger as the best he's ever eaten. It's made with beans, BBQ sauce, some molasses, and a whole lotta other good stuff. We've had our fair share of good burgers in Napa Valley, and these stack up to the best of them. 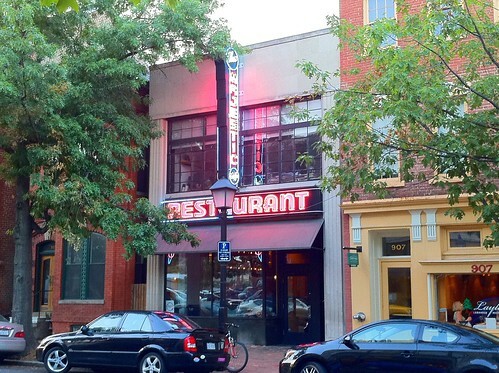 BGR, 106 N. Washington St. 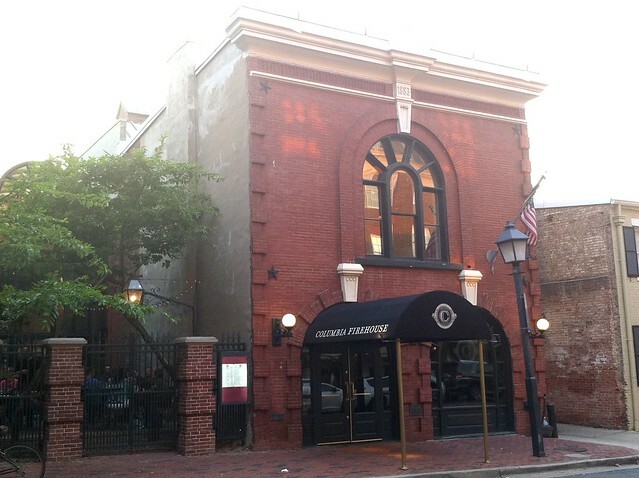 Though a long time location for a restaurant, the old firehouse building in the 100 south block of St. Asaph Street is home to the relatively new and aptly named Columbia Firehouse Restaurant and Barroom. Columbia Firehouse became a local favorite of ours almost as soon as it opened in 2010. The building was built the 1880s and served its previous life as an active fire station as recently as the 1970s. Now, the interior lends itself to a great ambiance, whether you are eating in the main portion of the restaurant, in the glass atrium, or in the small outdoor seating section, it's great any time of year. Beyond the building, the food is outstanding. 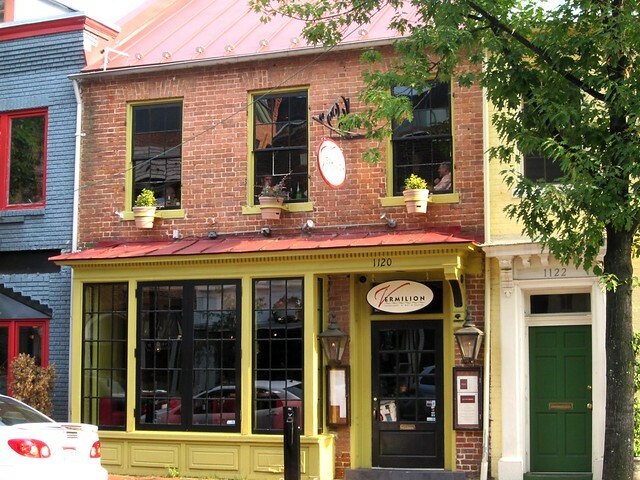 Their menu offers everything from comfortable favorites to adventurous dishes, all with a lean towards sustainability. The mussels are two absolute highlights, but we've not gone wrong with any of the dish we've ordered. Columbia Firehouse could easily be found among the great places to eat in the historic buildings of Yountville, California. Columbia Firehouse, 109 S. St. Asaph St.
Grape + Bean, 118 S. Royal St. & Lavender Moon, 116 S. Royal St.
One thing we realized about our many trips to Napa Valley is that some of the best places are actually the local favorites that you can always count on for some good food. They may not have three Michelin Stars like The French Laundy, but locals swear by them. We have many such locations, but I'll just touch on a few of our favorite places. These are just some places that helped us to fall in love with Old Town, and places that we feel are at home in either Napa Valley or Alexandria. These aren't new eateries, but are restaurants we always seem to find ourselves. The first is Anchor Bar inside of The Fish Market in the 100 block of King Street. 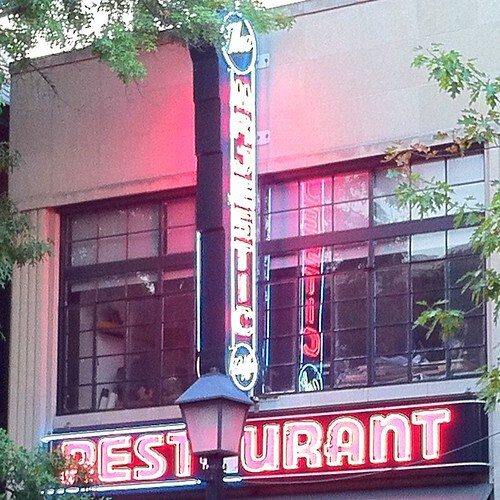 Though a very heavy tourist section of the city, Anchor Bar is a place where locals can always be found. Recently renovated after the flood waters of Hurricane Isabel in 2005, the interior is a casual but trendy bar that makes great use of its historic location. This is a staple for Alex & me on Fridays for their unbeatable happy hour. Schooners of select beer for just $6, buffalo shrimp, oysters on the half shell, and great fish tacos or lobster rolls. We've become regulars and dine there so often that the staff knows I'll have a 32oz schooner of Miller Lite, Alex will have his 16oz Yuengling on account of his being a lightweight, and one order of buffalo shrimp to split to start the evening. It lets me know that the weekend has arrived. If you go, be sure to say hello to the bar's manager, Jesse. He's a fellow Cleveland Browns fan (he even named his dog Kosar, like Bernie Kosar, the Browns quarterback from the late 80s) and can often be found commiserating with Alex about the state of the team. Anchor Bar & The Fish Market, 105 King St.
For dessert, look no further than nextdoor to Pop's Old Fashioned Ice Cream Company. Pop's, also part of The Fish Market, feels like an ice cream shop or soda jerk that our parents would have gone to. Though there are a ton of flavors to choose from, don't stress, I don't think we've found one yet we don't seem to like. If you're feeling particularly nostalgic, order yourself an Old Town Egg Cream, a chocolaty dream almost too good to pass up. 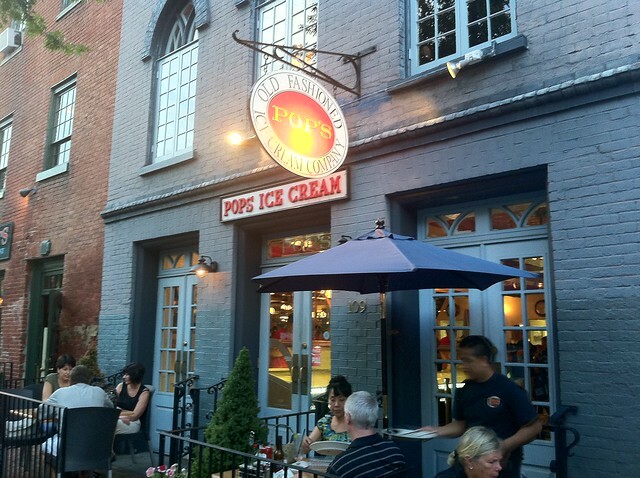 Pop's Ice Cream, 109 King St.
At the other end of King Street, just a few block from the metro station, you'll find our other go to locale for a fun evening. 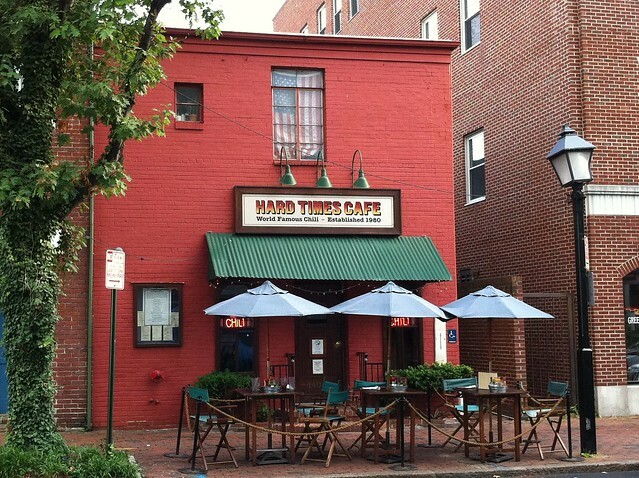 Hard Times Cafe has the best chili around and is the only place in the D.C. area that I'm aware of where you can find Cincinnati style chili. I particularly enjoy their vegetarian chili, which happens to be the spiciest of the four styles they offer. You can go the classic route of a 3-way (chili over spaghetti with cheese) or mix it up with their many offerings of chili delivery, like the Frito Pie. Yes, it's Fritos covered in chili, cheese, and sour cream. Hard Times Cafe, 1404 King St. There are so many good places, both old and new, that I've skipped over with this little virtual tour, so I know we'll need to do more posts in the future to cover them all. 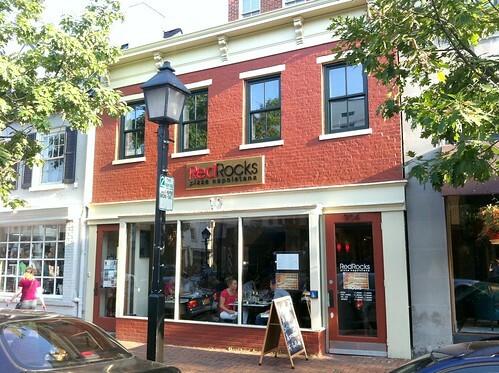 But this should give you a little taste of some of the more recent additions to the Old Town food scene and what it has to offer, as well as a few of our comfortable favorites. Remember, these are all within a 5-10 minute walk from our house, and they only represent about 10% of the total number of restaurant choices we have the option to walk to. Sometimes it is almost too difficult to choose. I hope you've enjoyed our culinary tour of new dining destinations and a few local favorites that have us feeling like we're just a little closer to Napa Valley than the true 3,000 mile separation. Have you had any great places pop up in your neck of the woods that has you thinking your favorite vacation destination has moved into your back yard? Note: We weren't compensated by any of the establishments mentioned in this post. We just love these dining options so much, we wanted to share them with you. Brother, Can You Spare $6,000,000 for the Lord Fairfax House? Epic post! 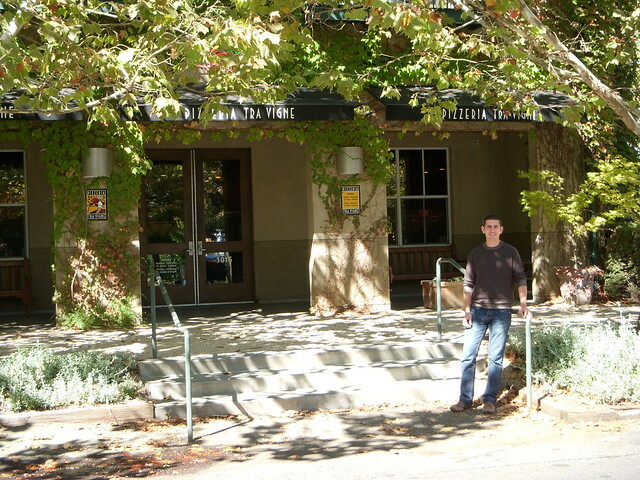 I've been to Napa only twice, but enjoyed it both times. I think a 3 day self-imposed limit is a good idea. I found your blog through the Apartment Therapy post a few days ago, and have since worked my way this far through your archives. GREAT BLOG. I love what you're doing with your place, and you've fanned the flame of my desire to see DC in the nearish future. That said, I'm enjoying the "Alex is a vegetarian but he eats fish sometimes" comments I've come across a few times now. I spent about 11 of the last 15 years being "a vegetarian but eats fish sometimes" person, too. I thought I'd share - there's a name for that!! Pescetarian (pronounced pesk-i-tarian), not to be confused with Presbyterian (which I hear a lot after I try to explain I'm not actually a vegetarian). Anyway... thought that might be a fun tidbit for you. It's funny because I've heard people call themselves pescetarian before under this exact description, but I feel like that implies a diet of primarily fish. But if that's the accepted label, that's what I'll go with. Well, at least until I eventually become a true vegetarian, then vegan, they maybe a fruitarian down the road. Ok, maybe I won't take it to that extent.